Interior Design's Editor in Chief Cindy Allen talks with L'Obervatoire International's Hervé Descottes. Photography by Erik Bardin. 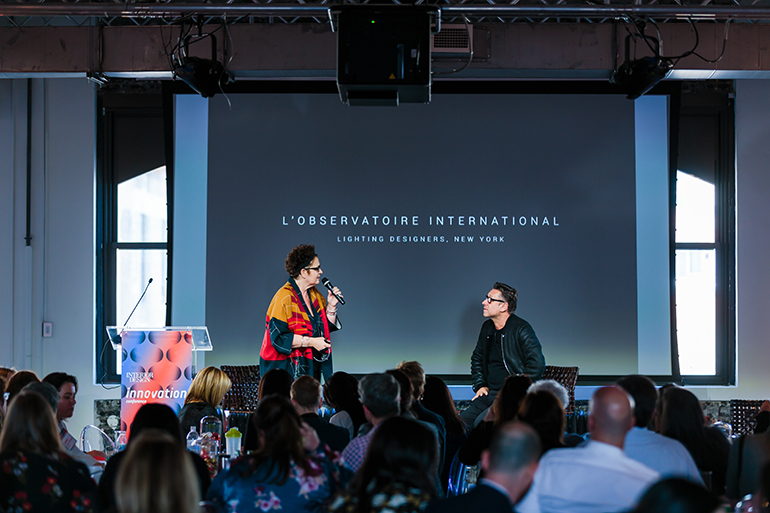 On the afternoon of Interior Design's inaugural Innovation Conference, attendees were treated to a candid talk with prolific lighting designer Hervé Descottes, moderated by Editor in Chief Cindy Allen. She spoke with Descottes about what has propelled his incredible career working on such projects as the Louvre, the Palace of Versailles, the Metropolitan Museum of Art, and many more. The talk began with an overview of Descottes’ work on the Louvre with I.M. Pei. Descottes implemented interior lighting solutions for the sculpture, tapestry, and art objects departments of the museum, but knew a major change was in store for him. That major change turned out to be his move to New York City, during the architecture industry’s 1993 lull. Conveniently for Descottes, this meant he and other industry professionals had the time on their hands to make introductions and facilitate his entree into the New York design and architecture world. At one point, he even met renowned architect Philip Johnson in his office. When Allen asked Descottes what he thought delineated his work from that of other designers who weren’t being commissioned for the projects, he replied, “I think what I brought with me, which was slightly different than other lighting designers that the team or the architect or designers were working with here, was [I was] talking about space.” The approach to first thinking about the space was the foundation of his connection with architect Steven Holl. “He was talking about space first, even [the relation of] light to the space. Even before talking technology, having a great idea of what the building should be about."